Instagram is without a doubt my favorite form of social media - it's easy to scroll through, read people's captions and more importantly see pretty snippets. After mentioning Boss Babes instagram last week and so many people liking them I thought I'd share the nine instagram accounts that always have me going through all their photos! @abbycapalbo | Abby is a Style Me Pretty editor and always features the most perfect New England snaps. She shares great drink recipes too! @designsbylaila | I recently stumbled across Laila's feed and honestly fell in love with her eye for interior design. Every shot is prettier than the one before and I love how she manages to infuse feminine decor while balancing it with more masculine pieces for her husband. @Ashleybrookedesigns | I'm a huge fan of all of Ashley's designs and her insta account always makes me want to be productive - what more can you ask for? @beinspiredpr | A PR firm based in LA that does press for lifestyle and wedding brands. As a girl who loves weddings, they always share the most gorgeous inspiration photos. @historyinhighheels | I've been following along her blog for quite some time and she also has the cutest etsy shop with the prettiest prints I've ever seen! She shares all of her travelling tips along with some gorgeous views on her feed. @spraypaintandchardonnay | I found Katie's account through a profile of her apartment on The Every Girl. She always shares her incredible DIYs that I sadly won't be able to do, but I have fun looking at them! @lemonstripes | Julia is a lifestyle blogger and also holds a pretty impressive 9-5 job! I love her feed because it's a good mixture of fashion, behind the scenes and of course chic inspirations. @theskimm | I start every morning with the Skimm email and love the girls insta feed for their funny one liners! I find myself laughing out loud with some of their grams, so much so that I need to share with friends! @melissaandreevents | Party planner and event designer extraordinaire. Melissa Andre owns her own company and seriously looks flawless while planning everything - I mean she could be Jennifer Lopez's twin sister! I'd love to know who some of your favorite instagrammers are and as a shameless plug you can follow me here! I'm following a few of these already but I definitely need to be following them all! Love Ashley Brooke Designs! She has the cutest stuff!! I loved the Bossbabe account and have been following them since you mentioned it. So, now I'm off to follow the ones of these that I'm not already following--thanks for the rec's girl!! Love scrolling through Insta and finding my new favourites to follow! Thanks for the list lovely!! I was already following some of these accounts and now I'm following several more!! So much pretty! Most of these are new to me - thanks for the heads up. I love a pretty IG feed! ooh--almost all of these are new to me, so i love looking for more instas to follow. thanks, biana! I recently joined the skimm email list, I will have to go check out the Instagram feed as well. I didn’t know Skimm had an insta! I love their daily emails and now need to checkout their other account! Love Ashley Brooke Designs! I'll have to check out the others! I agree - instagram is my fav, too! It makes such a big difference when you're following fun accounts, too! I"ll have to check a few of these out. Such a fun post! I agree, Instagram is my favorite too. These look like some great accounts! I'm definitely going to have to check out The Skimm and Melissa Andre, they sound great! Great round-up...how did you know I am working on something similiar ? :) It's fun to share inspiration and beautiful accounts...love these! Love finding new Insta accounts! I had no idea The Skimm had one - off to check it out now! Love finding new IG accounts! Can't wait to check them out! Isn't Julia amazing?! I've followed her on Instagram and in the blog world for quite some time and she's such a lovely person. I also love how she's open with her depression and anxiety. I really find her such an amazing role model. (: I'll have to check these out! don't you just tart to droll over history in high heels photos sometimes??? She literally has one of the best Instagrams!! OH and ps. your packing post was awesome way better than mine!!! I'll definitely be following the ones I am not already! Thanks! Instagram is totally my fave! I keep up with it the best as well, ha ha! Genius idea to follow the skimm! I get their emails as well but never thought to follow on IG! Great recommendations!! I will definitely be checking these out! Instagram really is the best for pics. I read Skimm every morning, but had no idea that they had an Instragram. Adding it to my list! Love this! I'm always looking for inspiring insta's to follow! Instagram is my favorite form of social media as well - can't get enough! 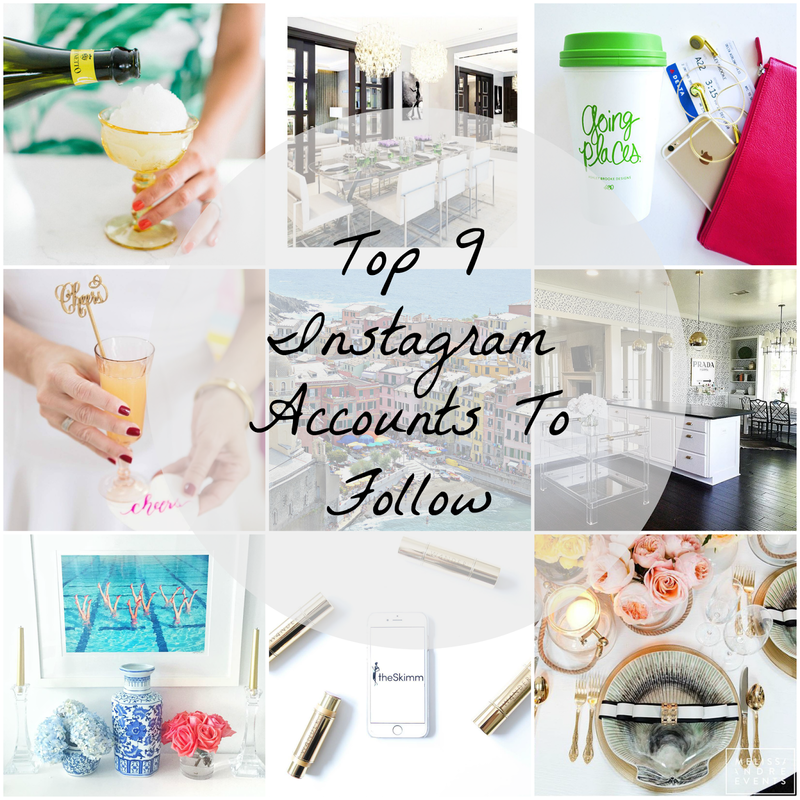 I'll have to check these ladies out - their feeds all look gorge! So incredibly honored and touched! Thank you for including me with all of these fabulous folks! Cool! I'm always looking for new ones to follow for inspiration. Great post as I'm always looking for new people to check out. Your IG is totally one of my favorites. Will check them out - thanks for sharing! Man- I love me a nice crisp instagram account. Mine looks 100% not like that, but I get googly eyed when I see it! I'm going to follow right now! Insta is my addiction! I LOVE instagram. I don't know how much time a day I spend scrolling through...it's kind of ridiculous. i don't follow any of these - i had no idea the skimm had an instagram, that's brilliant! I'm new to Instagram and I've learned to love it. Now I just need to get used to sharing more. I can't wait to check these Instagram pages out! Thanks for some good ideas of new accounts to follow!! Happy Wednesday... hope it's a good one!! I signed up for The Skimm e-mails, but I never thought about their IG. I just followed and you are so right -- so hilarious! Thank you for that! I never tire of Instagram. Get through your own feed - click on a hashtag & keep looking. I'm a picture person anyways. Can't wait to look through some of these accounts! I love finding new pretty pictures and people to follow! So fun! My instagram feed is going to be a lot prettier now! Great IGers! I started following a few... loving there pics! Lemon Stripes is a favorite of mine! Always love her pictures! I love the skimm and had no clue or never thought to look for an instagram account for them, yay!!! Love your list -- I follow a lot of these! Don't you just love Instagram? I definitely am going to check out a few of these accounts that I wasn't familiar with - thanks for sharing! Instagram is my favorite too! Love this! I'm always looking for new interesting people to follow on IG, checking all these out now! What a great list, I just started following like 5 of them haha! Thanks for the wedding inspiration too! what a fun post! looks like some cool instagrams! Ashley Brooke has been a favorite for a while, but I definitely want to follow the rest of these now, too. I love finding new accounts! I need to add a few of these! Thanks for the recommendations! I don't follow enough accounts like these! Awesome recs! These look great, thanks for the recs! I love Instagram too! Gorgeous!! I love Ashley Brooke and I had no idea the skimm had an insta!! ooh going to follow all of these! I love scrolling through for some inspiration! So many good new accounts to check out! I still don't follow too many people other than bloggers I follow and a few celebs, so it will be nice to add a few others. I will definitely check these out! I loooove me some instagram. So fun! Thanks for sharing these!! I hope you are having a great week babe! OMG thanks for sharing this. I love finding new insta accounts to check out! Great picks! I'll scrolling through them all now. Great picks! I love clean, bright IG photos (I guess everyone does since these accounts have loads of followers! LOL)...I have met Ashley a few times (she is in Orlando) at a conference I attend every year, and I just love her products! LOVE the Skimm; need to follow their Insta for sure! Great account rundown, babe! Great suggestions! I love home design accounts so I'll def be checking out Ashley Brooke! I don't follow any of these, but am definitely going to start! Thanks for sharing Biana! Such good suggestions :) I'm following all of these! This is great! I love finding new accounts to follow! I spend too much time on instagram....I'm going to go check out these new people to follow! I follow Ashley Brook Designs but will check out the rest. Instagram is by far my favorite social media. these are all beautiful insta accounts!! !